The weather was pretty nice.. We piddled around in the morning, then around 11:30 Muscle Man decided he wanted to run our long run, pushing the boys?!?!?! I was a little baffled since I already had Tall Grandma on the line to watch the boys the next morning… And I knew that Muscle Man would need to eat soon… Hmmmm… Not to get in his way, I got snacks ready and we set out..
***I had originally thought of Honey Bucket Inspectors, but Muscle Man came up with a more feminine name..
>>>>Back to the run, we set out and the boys were FUSSY!! And by boys I mean all 3. Poor Muscle Man had a cramp in his side and was SUPER HUNGRY (Did I call it or what?) I knew there was no way we would get in a long run, but we could salvage a few miles.. We went out half way and then took the little trail to the river so the boys could toss in some sticks, the ice/snow storm in January had knocked down trees across the path. I got a few scrapes in the effort but didn't realize until we got home. We turned back, 4 miles done… good news is we would have fresh legs for the long run take #2 the next day.. Tall Grandma watched the boys (thanks Mom!!) so we opted to start from the Orting Park. The trail was busy busy with people, bikers and runners. It was a strange mix, almost like there were trainers with their clients. We also saw 5 couples, which was very cool. There was a group of 3 well-dressed women on bikes, one lady complimented my grey Sugoi jacket…they stopped to check out the area that looks like a Beaver created it, but there is no Beaver, we ran past.. As they sped by again they asked what we were training for… on their return trip they cheered us on, very nice!! I wore a jacket like a dope, not needed in 55', so I took it off when I stopped to admire a large bullfrog in the marshy area next to the trail. The goal was to run 11-12 miles, when we got around the turn MM picked 12!! 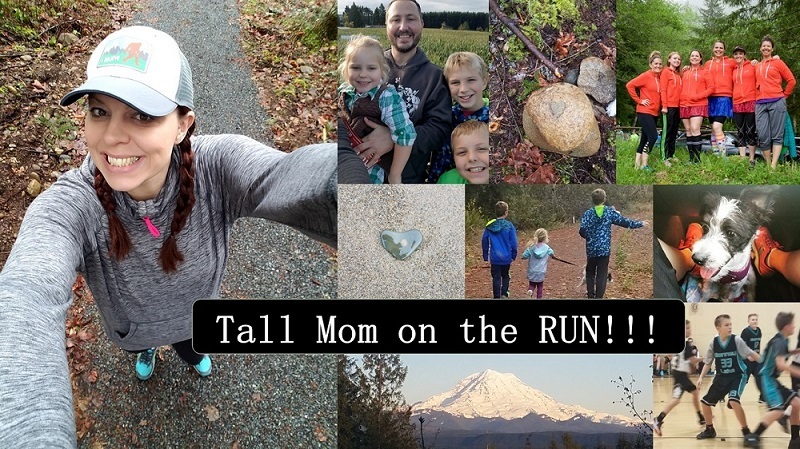 About the mid way point we saw a older-looking man on the street which parallels the trail, he was jogging, wearing a stocking cap, sweats and sweatshirt… he stopped, looked both ways then dropped and started doing pushups.. VERY STRANGE! 6.0 miles done, half way… MM had his Chocolate Gu, I had a couple chomps, we both drank from our handhelds, and off we went. The return trip is a slight decent, which felt really good. We saw some of the usual people, funny how you get to 'know' people if you run a path enough… Having a high metabolism is tough, my poor hubby was pretty depleted toward the end. I mentioned that there was a McDonald's near the trail head…pretty sure he ran the last mile for FOOD.. Our final mile was the fastest of the run.. I am happy to report that I (we) have run over 100 miles for the month!! Gotta love sticking (sort of) to a training plan!! 2 longs runs left before MM's first Half on May 20th!! CONGRATS to all of you who raced last weekend.. With Eugene, Big Sur and other races there was a lot going on. I am PUMPED it is racing season!!! 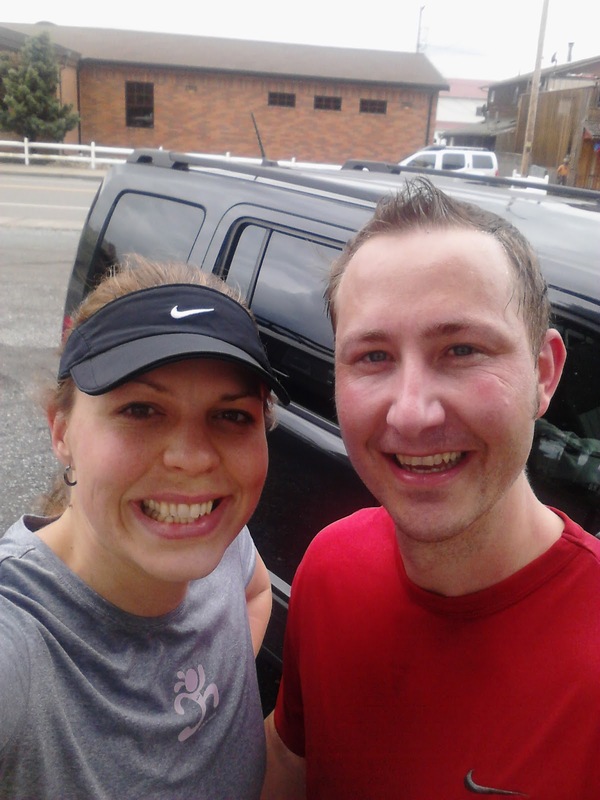 Great job on your 12 miler! That Ranier to Ruston Race sounds fun. I will have to remember it for next year. It is the same day as the NODM half. 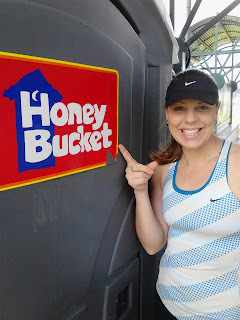 Congrats on 100 miles and your Honey Bucket "sponsorship". I love it! I finished with 98 miles for April. Honestly. love the honey bucket signs. Never gets old to me. Always makes me smile. but honestly the 12 with your husband . . . that's so awesome. Honey Buckets is hysterical. Congrats on the 12 miler. I love that name...and I think you all will have a blast! Good luck to Muscle Man! Love that you have got to spend 100 miles together!! So stinking awesome!!! I like on FB and follow your blog.